As you can see from the second of Ben Baldwin’s superb new covers for the Aldabreshin Compass series, this book has dragons! Big dragons. Dangerous dragons. As those who’ve already read The Thief’s Gamble can tell you, dragons in Einarinn can be truly devastating. And for those who’ve read The Thief’s Gamble and still have a whole load of unanswered questions about dragons in this world, rest assured you will find answers in this book. Some answers, anyway. Dragons really are the archetypal epic fantasy monster. They feature in some of my very favourite books and series, as far back as I can recall. Was Smaug the first one I encountered? Smaug the Terrible, as proved by his merciless destruction of Lake Town, for all that he amused himself chatting to Bilbo beforehand. Or was it the Ice Dragon, Groliffe, in the Saga of Noggin the Nog? He’s Honorary Treasurer of the Dragons’ Friendly Society, you know. So dragons that communicate and co-operate were among my earliest childhood encounters as well. That duality’s been there through my subsequent fantasy reading. Anne McCaffrey’s dragons on Pern; mighty beasts yet telepathic and empathetic. On the other hand, the massive, murderous creatures of Melanie Rawn’s Dragon Prince and subsequent books. The devastating dragon out to destroy Ankh Morpork in Terry Pratchett’s Guards! Guards!, alongside the pathetic swamp dragons of Lady Sybil’s Sunshine Sanctuary. Naomi Novik’s Temeraire series has any number of breeds of dragons, ranging from the brutish and violent to the intelligent and cultured – and just as many different ways for humans to interact with them. Dragons in the Harry Potter universe on the other hand, all seem to be terrifying and lethal, whatever their breed. Robin Hobb’s dragons will co-operate with humans as long as doing so suits their own purposes, or just their current whim, but any ‘keeper’ who thinks they’re in charge is likely to get a surprise. Morkeleb the Black offers Jenny Waynest untold gifts in Barbara Hambly’s Dragonsbane, but at what cost? We’re still waiting to see which side of the scales George RR Martin’s dragons will come down on, in A Song of Ice and Fire, but Daenerys Targaryen really had better keep her wits about her, don’t you think? What about the myths that spawned all these fantasy beasts? Manifestations of the Universal Monster Template? I’ve been reading about them in books of folklore for just as long as I’ve been reading fantasy fiction. Not only the tales of Fafnir and Siegfried and such which inspired Tolkien and CS Lewis in varying ways, or the umpteen variations on St George’s story. Every English county seems to have its own local subspecies of dragon – The Lambton Worm (County Durham), The Mordiford Wyvern (Herefordshire), The Wantley Dragon (Yorkshire), to name but a few. The iconic red dragon of Wales, intertwined with the myth of Merlin and Arthur, is only one Celtic dragon myth, alongside the Dundee dragon, the Oilliphéist in Ireland fleeing St Patrick, and many more. Towns and villages right across Europe have tales of similar local beasts, usually spreading blight and destruction, with an appetite for young maidens. All so very different to ethereal oriental dragons with their ties to nature and the elements. It sometimes seems a wonder that any fantasy author would write about anything else. I’ve only mentioned a few of the best known books on my shelves here, so feel free to flag up your own favourite books with dragons in comments. Fellow authors, by all means offer a brief introduction to your own take on the beasts. So what’s this particular dragon’s role in Northern Storm? You’ll have to read the book to find out, and all being well, the ebook edition will be rolled out across the various sellers over the next week or so. Keep an eye out for updates. I have a suspicion we can trace dragons back to Smaug? Tolkien has been a huge influence on genre and Smaug is one of the scariest dragons I’ve met. (I use dragons in THE HOUSE OF SHATTERED WINGS, but they come from a… different tradition. Let’s just say breathing fire isn’t the idea of dragons’ powers I grew up with). I’m fascinated by the differences between European and Oriental dragons. now that is a very interesting question! Loved Southern Fire, can’t wait for Northern Storm. I love the idea that the concept of dragons could have been carried to the British isles with the Romans and their Sarmatian cavalry units (https://en.wikipedia.org/wiki/Draco_%28military_standard%29). Some think that this is where the term ‘Dragoon’ came from – rather than the French musket design – as well as being the source of the creature on the Welsh flag. I do like that possible Roman link! 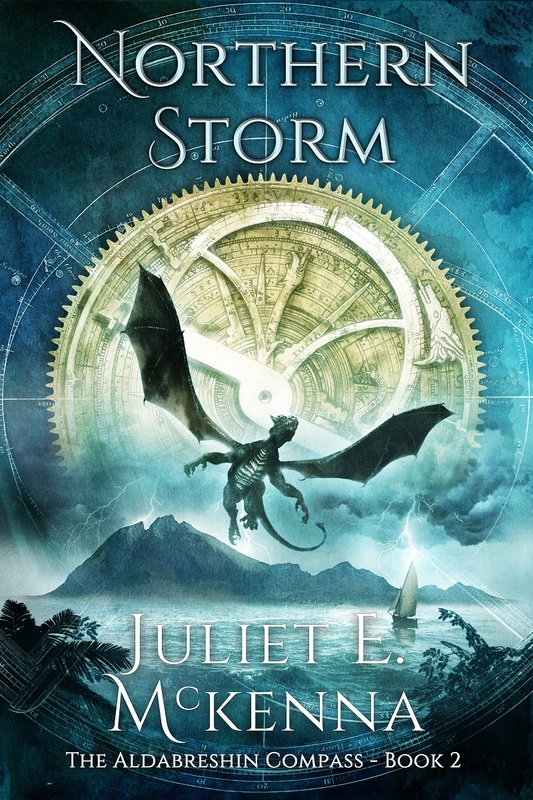 Juliet, that is a gorgeous cover. Congratulations! Some of my favorite dragons are Naomi Novik’s sweet, earnest Temeraire (and fiery Iskierka) in her Temeraire series and the fabulously wicked dragon in Gail Carson’s MG book The Two Princesses of Bamarre. It’s glorious, isn’t it? And yes, I love the Temeraire books and dragons. Gail Carson? That’s a new title recommendation for me, many thanks! But whoops! I just looked back at this and realized I’d typed my original comment too quickly – I meant Gail Carson Levine. 🙁 Sorry about that! Wow, that’s a *great* cover, and a *really interesting* dragon. I’ve been also been fascinated by the difference between the (relatively — one must say “relatively” in these cases of dealing with an alien intelligence) benign Chinese dragons and the European Destroyers of Countrysides. I prefer the Chinese sort, myself, but, then I was born in a Year of the Dragon, so perhaps that’s not a surprise. I remember finding Dragonflight on the spinner in our local drug store and grabbing it (the first time I spent the grocery money on a book) because — dragons! And *new* dragons, though still alien. I guess I always knew that I would write about dragons someday, the only problem being that — Steve and I write science fiction, mostly. So the dragons in our Liaden Universe are human, serving a sentient tree, who once had *real* dragons, before the death of a universe. Orm Embar from the Earthsea books by Ursula Le Guin is a dragon who has stuck with me. Kalessin from the Earthsea series, who while is of fire and wind reminds me more of Eastern dragons in temperament. A glorious and intriguing cover, Juliet. I grew up, dragon-wise, with Le Guin and Tolkien and Kerr, but when I started writing, I never intended to write about dragons, because who could compete with those? But then I discovered a world where dragons were used as a weapon of war, and “the devastation they wrought on land and cities and people was so terrible that there was no shifting of loyalties or blending of peoples or softening of borders, no forgiveness, and no respite from vengeance.” Thus it was amazing and terrifying to my hero, a gifted singer, that it was only by listening to the cries of dragons that his talent grew to the point where he could make the people of these war-torn lands see visions that took them away from the horror for a little while. Song of the Beast is still my only dragon novel, as I can’t get those out of my own visions! Dragons ARE magical. Best wishes with your version. Another book for my TBR shelf.